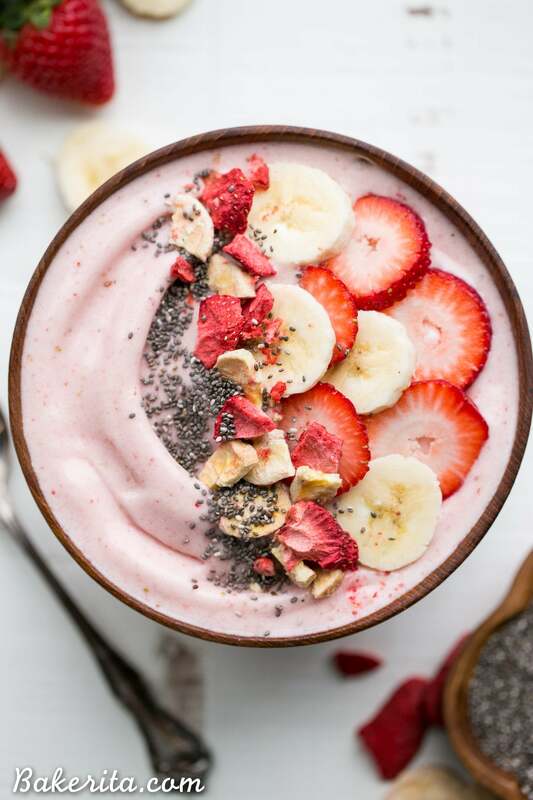 This easy Strawberry Banana Smoothie Bowl is a simple and sweet treat! It’s a healthy Paleo + vegan breakfast or snack made with only a few ingredients, and you can add whichever toppings your heart desires to customize to your tastes. Smoothie bowls: yay or nay? I LOVE them, which is obvious based on the number of smoothie bowl and acai bowl recipes I’ve posted on the site, as well as the frequency with which I make them for breakfast and go out to local juice bars to get them. But, some people don’t see the point. “Why do you need to EAT your smoothie with a spoon?” they say. “Who has time to sit and eat a smoothie?” they ask. I’ve seen smoothie bowls on a whole bunch of lists of food trends that have gotta go in 2017. I’m here to revolt against that, because at least over here, smoothie bowls are here to stay. When I drink a smoothie, I never feel like I’ve had a real meal. I can’t drink a meal through a straw and get the same satisfaction as a meal I ate with a fork or spoon – no way. When I’ve had a smoothie bowl though, thick and creamy and loaded with delicious crunchy + fruit toppings, I definitely feel like I’ve had a meal, and it’s enough to keep me going through the morning. Bonus – they’re so refreshing, and absolutely delicious. When I was a kid, strawberry banana smoothies were my favorite, and my go-to whenever one of my parents made me a smoothie. 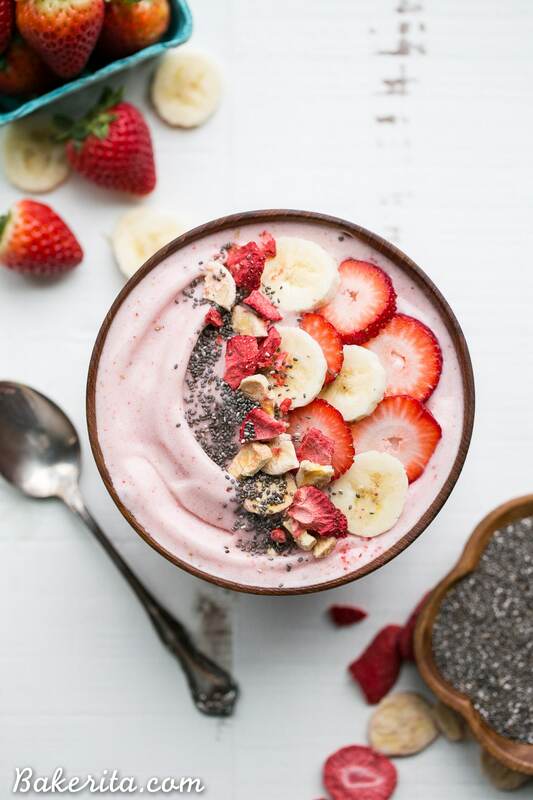 Strawberries and bananas are still two of my faves, and man, I think they make a better smoothie bowl than they do a smoothie! Mostly because I can add EXTRA bananas and strawberries and other goodies on top. 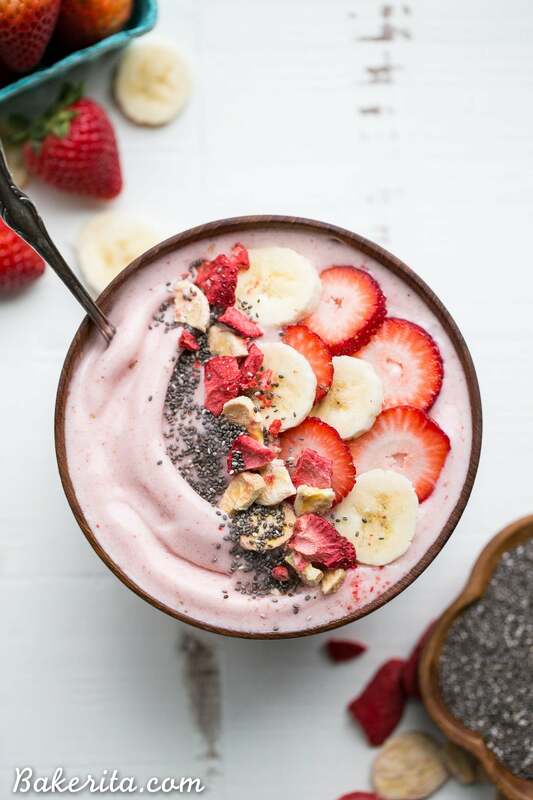 This Strawberry Banana Smoothie Bowl couldn’t be much easier to make with just three simple ingredients for the smoothie base. I went to my neighborhood Ralph’s to shop for my smoothie bowl goodies, and grabbed my fave Silk Unsweetened Coconut Milk to use as the blending liquid for my smoothie. I love the slight coconut taste and how creamy it makes the bowl. I find the banana adds enough sweetness for me, but you can use the original Coconutmilk if you want things sweeter. I also headed over to the healthy snack aisle and grabbed some Simple Truth Freeze Dried Strawberries & Bananas to top my bowl with – they’re so good I could eat them all on their own and they make the perfect crunchy topping for my bowl, especially paired with fresh strawberries and banana slices. A sprinkle of chia seeds rounded out the top of my bowl and provided some extra nutrients too. If you want more crunch, you can find a ton of nuts and snacks that are perfect for topping your bowl near the Freeze Dried Strawberries & Bananas in the healthy snack aisle at Ralph’s, too. I wanted to grab all the delicious-looking Simple Truth snacks! If you’re still iffy on the smoothie bowl trend, you’ve got to try one to make up your mind! Let me know where you stand in the comments :) enjoy! 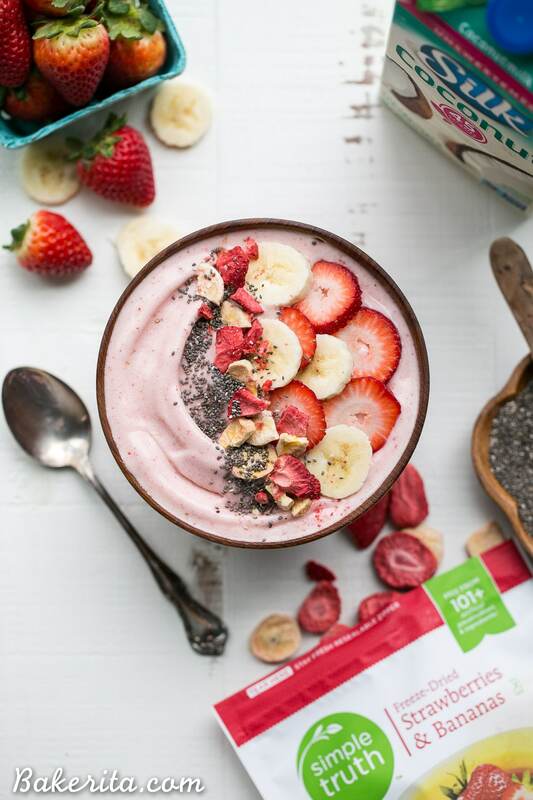 This easy Strawberry Banana Smoothie Bowl is a simple and sweet treat! It's a healthy Paleo + vegan breakfast or snack made with only a few ingredients, and you can add whichever toppings your heart desires to customize to your tastes. Combine frozen banana, frozen strawberries, and coconut milk in a blender (I used my Vitamix). Puree until completely smooth - the mixture should be thick. Add a touch more liquid if necessary to get it to blend completely smooth. Transfer to a bowl and add toppings as desired. Enjoy! Nutritional facts do not include toppings. This post is sponsored by WhiteWave Foods and Kroger. As always, all opinions are my own! Thanks for supporting the brands that support Bakerita. YES! I’m all about smoothie bowls. It just seems more fun to eat it with a spoon! :) And you make the best smoothies, Rachel! 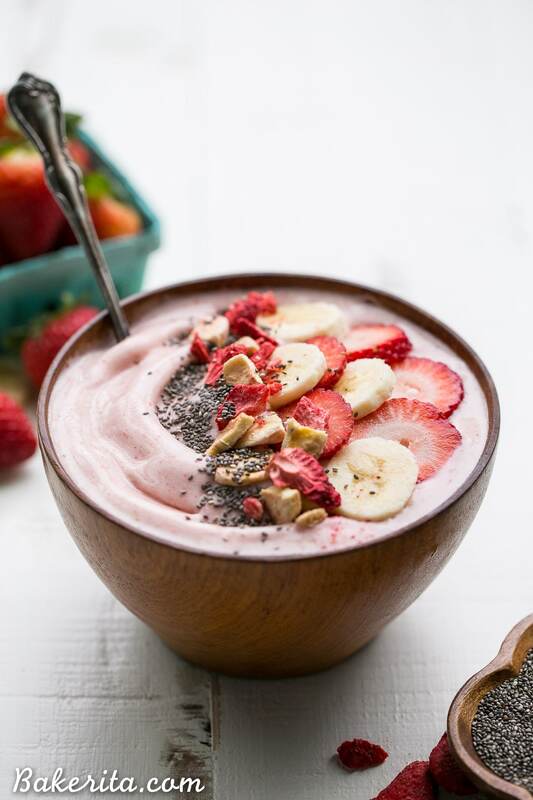 Strawberry banana smoothies are one of my favorite flavors, so I am especially loving this bowl. Wish I could dive right into this for breakfast! I have never had or made a smoothie bowl and I feel like I’m missing out on something wonderful. So I’m inspired by your beautiful (and no doubt delicious!) strawberry banana version. Putting this on my must-make list right now! Big fat yay to smoothie bowls. I just feel fuller after I eat them as opposed to plain ol drinkin a smoothie. I love this pink tint! Same here! I think actually eating with a spoon, as opposed to drinking, tells your body to feel fuller. Thanks Annie! I know exactly what you mean! When I drink a smoothie through a straw it doesn’t fill me up nearly as much. This looks so good, and the light pink color is so pretty! The toppings are quite possibly the best part :) thanks so much for the love, Elizabeth! Smoothie bowls are definitely better than smoothies :) thanks for the love Melanie – hope you love this recipe! I love smoothie bowls because you can pile on the toppings — and that’s the very best part! Strawberry banana is one of my favorite flavor combinations and this is just calling my name. You styled this so beautifully too Rachel! I totally agree, smoothie bowls are here to stay! This looks delicious! I think strawberry banana is probably my favorite combination following peanut butter and chocolate haha! I tried the strawberry and banana smoothie bowl but used regular milk. My smoothie turned out much more liquid and less thick then it looked in your picture. Do you think this is because of the milk I used. Regardless of the consistency the bowl was still delicious!! Hi Olivia, I don’t think it would be because of the difference in milk, but sometimes blending for too long can thin it out. If you’d like it thicker, you can always add a bit of extra frozen fruit or use close to a 1/4 cup of milk. So glad you enjoyed it, though! This was yummy! Thanks for sharing. ;-) I subbed homemade almond milk. So glad you enjoyed it, Lynn!! I’m currently eating this delicious smoothie bowl! I’m very happy right now! The only thing I did differently was put in some pumpkin seeds just for an extra kick of protein. Tastes really good! For the toppings I also deviated, but it’s still amazing! Glad you’re enjoying it, Amaranth! Thanks for the feedback.